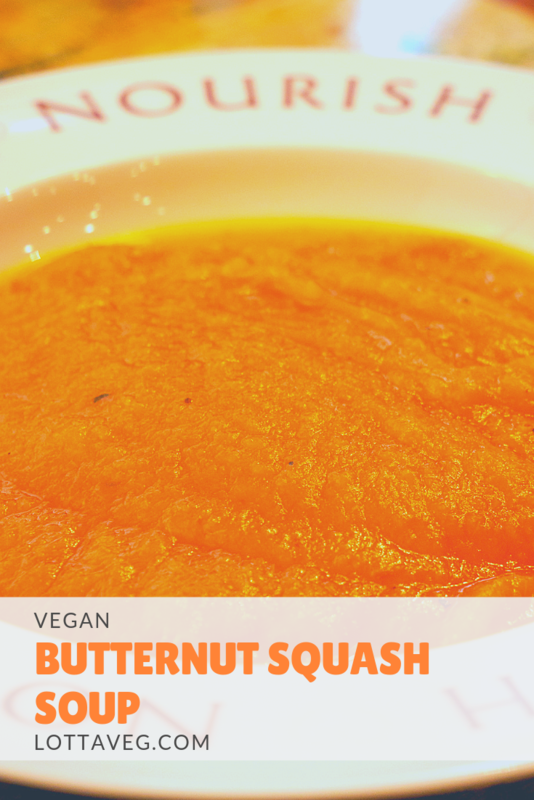 This Vegan Butternut Squash Soup recipe is perfect for cold fall days. It’s has a nice savory/sweet flavor and it’s easy to make. A bowl of this hot soup will warm you right up! Living in Ecuador, we have a very limited selection of squash so when we return to the states for a visit with the family, we load up on butternut, acorn and spaghetti squash when we go to the store. We were going to make our Healthy Butternut Squash recipe, but Amelia’s mom spotted a butternut squash soup recipe in a magazine and suggested we use the squash we bought for that, instead. It was a great idea because this soup was delicious! The unseasonably cold fall weather here in Atlanta made it even better! We paired this soup with a large Easy Garden Salad and a bowl of fruit for dessert. It was a flavorful, filling and nutritious lunch. 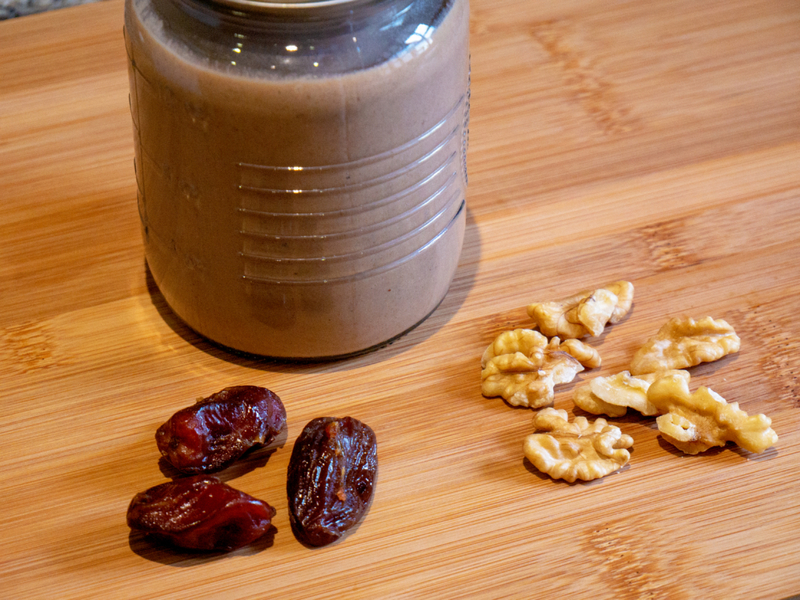 This oil-free Date Walnut Vinaigrette Salad Dressing recipe is rich and delicious! Most vinaigrettes have oil, but since we’re oil-free plant-based eaters, we used walnuts as the (truly) healthy fat. The dates give it a little sweetness and the balsamic gives it a little tanginess. Many of the phytonutrients in dark leafy greens and other vegetables are fat soluble, which means you need some healthy fats in your digestive tract at the same time as the veggies to allow your body to extract the most nutrients. A lot of people still think oil is a healthy fat, but it comes with a lot of extra baggage and lacks all the fiber and many of the beneficial nutrients that come in the whole-food form. Oil is essentially a refined fat that may have some healthy ingredients, but it’s packaged along with several unhealthy ones. It’s far healthier to get your healthy fats from whole foods like nuts, seeds and avocados instead of processed foods like oil. Using 3/4 cup of water in this recipe yields a pretty creamy salad dressing. You can make it even thicker by cutting back to 1/2 cup water, or you can thin it out by using a full cup. It really depends on your own personal preferences. 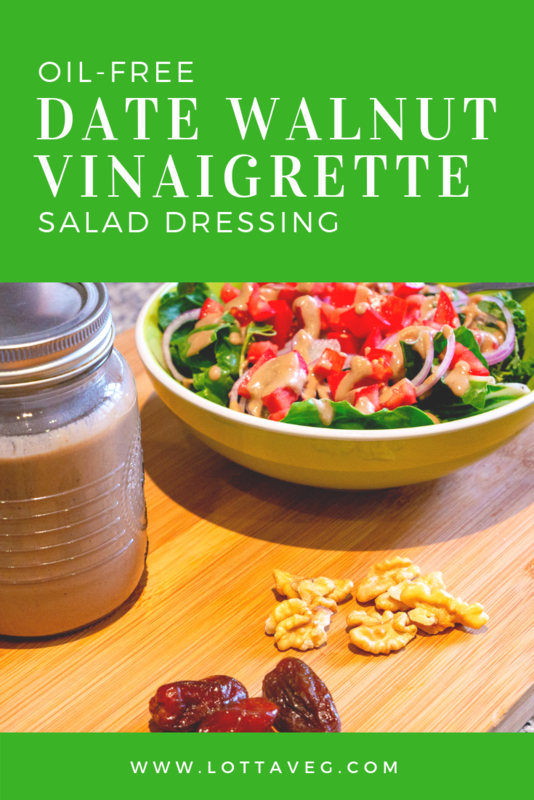 You can put this delicious Date Walnut Vinaigrette dressing on most of your favorite salads, including our Easy Garden Salad, Spinach Salad or Hearty Side Salad. 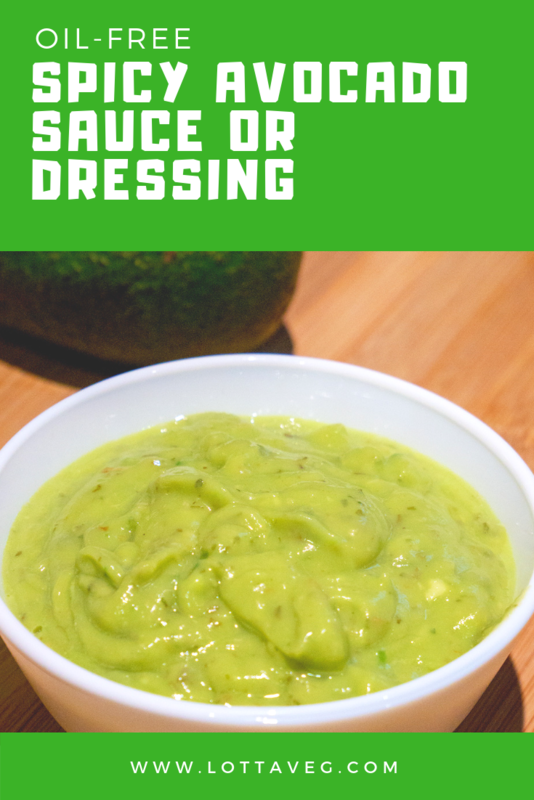 We made this Spicy Avocado Sauce to go with our Cauliflower Tacos w/ Lentils recipe and it was delicious! It’s so rich and creamy. And the jalapeño gives it a little kick, although this is optional if you don’t like spicy things. This recipe is also great as a dip, sandwich spread or salad dressing. It almost has a ranch dressing flavor. Several important phytonutrients in salads are fat soluble, which means they need to be consumed with a healthy source of fat like nuts, seeds and/or avocados in order for our bodies to effectively extract all the nutrients. Avocados have been shown to contain a lot of fiber and many beneficial phytonutrients of their own, and the fat found in avocados also helps our bodies get the most bang for our salad buck. It doesn’t take much fat for our bodies to harness the power of fat soluble veggies, though. You only need about 1/4 of an avocado in your salad OR five walnut halves to get the benefit from the greens, so don’t load up your salad with a lot of nuts, seeds and avocado or the calories and fat will skyrocket. A little is good for you, but a lot is bad for you. We like our foods spicier than most, and Amelia likes them spicier than me! If you have a bland palette, feel free to skip the jalapeño. This Oil-Free Summer Black Bean Salad recipe was inspired by a recipe from Amelia’s Aunt Marie. It’s easy to make and full of color and flavor. It tastes great all by itself as a side dish, or over a leafy green salad. Last time we were back in Atlanta visiting Amelia’s family, her mom Jane made us this dish and everyone loved it! Aunt Marie included olive oil and cheese in her recipe, so we just removed those and didn’t notice them missing. In fact, I’m guessing the cheese would overpower the mild flavors of the other veggies. 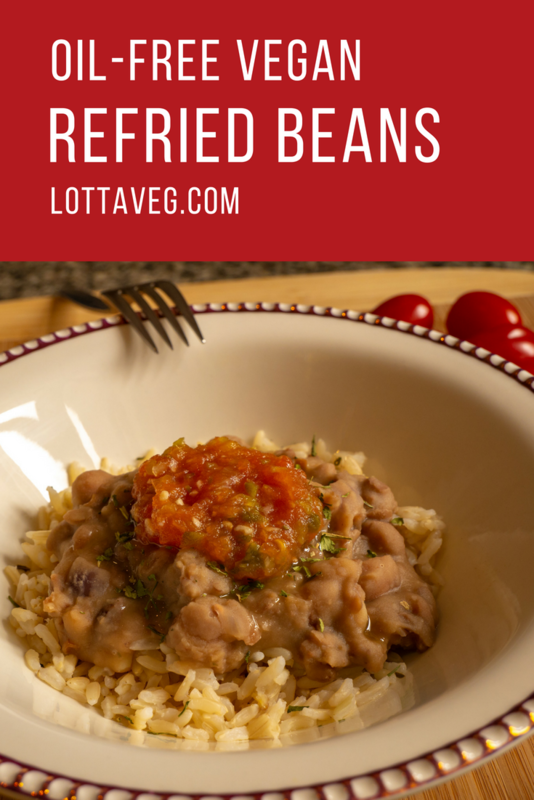 A friend of ours told us this recipe is similar to Cowboy Caviar. However, real Cowboy Caviar also has black-eyed peas, diced tomatoes, and several other seasonings. Aunt Marie’s recipe is certainly a lot easier to make with its fewer ingredients and most of the flavor coming from the salsa. Amelia’s mom inspired us to make more dishes with salsa as the flavor enhancer. It’s a lot easier and faster to make a delicious dish when all you have to do is open a jar of salsa and pour it in. We generally use my Grandpa’s Vegan Dipping Hot Sauce instead of store-bought salsa because we think it tastes better and it also saves us about $3/jar. 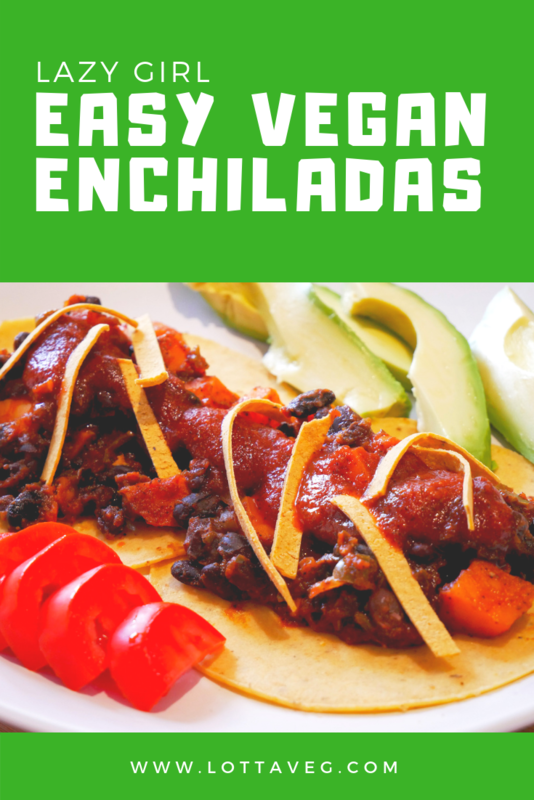 This recipe makes a great side salad for your favorite Mexican dishes, like Vegan Tortilla Soup or Mexican Lasagna. 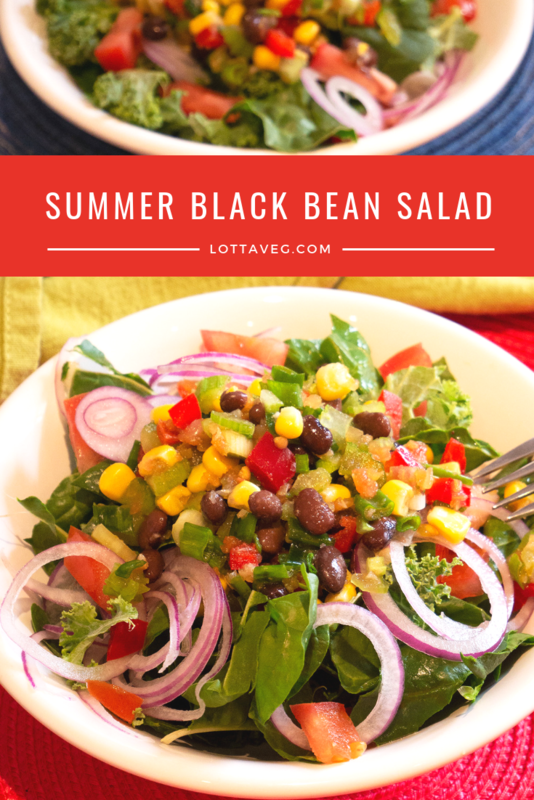 If you choose to eat this Summer Black Bean Salad over leafy greens, you may want to add some fresh lime juice and/or vinegar to the greens beforehand to give them more flavor. 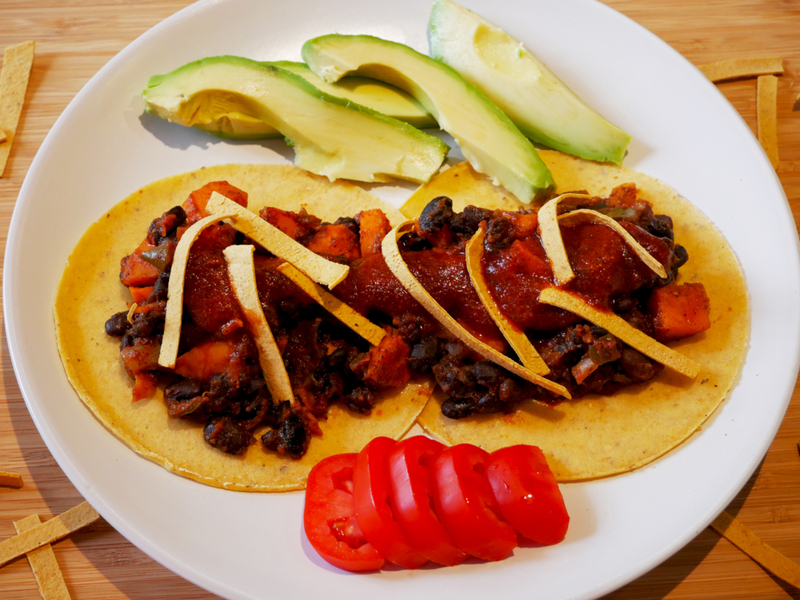 Amelia’s Oil-Free Vegan Refried Beans are so good you won’t be able to stop eating them! They require very little effort to prepare and they’re amazingly delicious. And did I mention they’re oil-free? That means no empty calories from oil, which is commonly added to canned refried beans. This recipe calls for canned pinto beans, but it’s also delicious with black or canary beans. If you’re using Dried Beans, soak them for at least 4 hours, then rinse and drain. Cook over low heat for about 2 hours in enough water to cover the beans. You want the beans to be soft. We usually do this the day before we want to make the refried beans so they’re good to go. You don’t need to rinse and drain your cooked beans…you can use the liquid from cooking previously for your refried beans. This Broccoli Chickpea Chipotle Buddha Bowl is easy, fast, oil-free, low-calorie, nutritious and delicious. It’s a great recipe if you’re in a hurry and watching your calories. Since I stepped up my gym workouts, I’ve been wanting a high protein lunch that’s fast and easy to prepare. I made this one before my workout so it was ready when I got back from the gym. If I don’t plan ahead like this, I find myself eating the first thing I see when I get home instead of the best thing for a post-workout meal. This is the second Buddha Bowl I’ve created after Amelia encouraged me to take on this Buddha Bowl project. 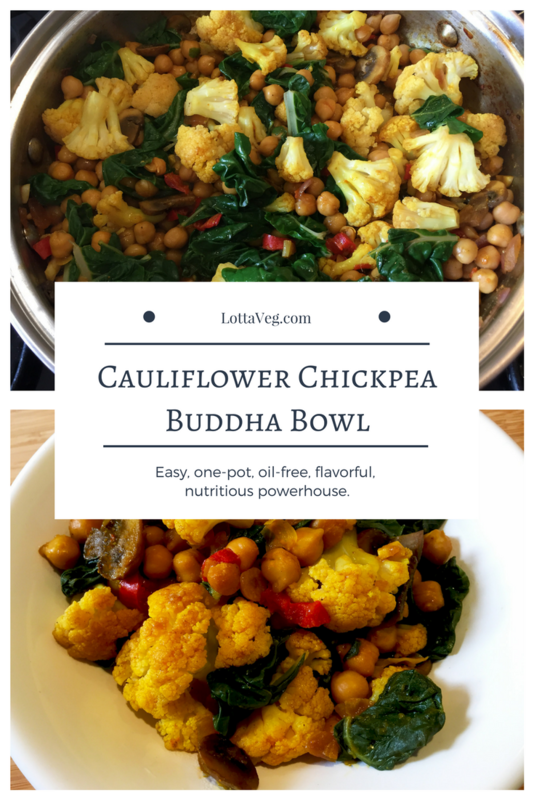 The last one was the Cauliflower Chickpea Buddha Bowl and it was also amazing! I created this Buddha Bowl with the ingredients we had on hand. We always have onions and garlic, but today we also had broccoli and red cabbage. They add a lot of color and antioxidants. Red cabbage is one of the best foods you can eat for preventing and fighting cancer. The brighter color a food is, the more antioxidants it has. That means red cabbage has more than green cabbage. Plus, I like the taste of red cabbage better than green, although both are delicious in the right recipe. I like to sauté my onions and garlic separately so they get a little extra tender, but you can probably put everything in the pot at the same time and cook it all together. That’ll make it a little easier. Steam frying is the key to sauteing veggies without oil. You need to use a generous amount of vegetable broth, and cover the pan so the moisture doesn’t evaporate. We try to cook without oil as much as possible, and there’s really no need to use it when you’re sauteing veggies. It just adds a lot more calories without much other benefit. Despite the common myth, your body does not need fat from processed oils. You get all the fat you need from unprocessed plants. Oils may even contribute to heart disease and several kinds of cancer. If you don’t have any chipotle seasoning on hand, you can swap that out for chili powder or some spicy Thai hot sauce. You can eat this dish without the brown rice…it’ll just decrease the number of servings. Personally, I love brown rice, and it’s far better for you than white rice. Brown rice has been shown to help with weight loss and type 2 diabetes, while white rice can make both of those worse. 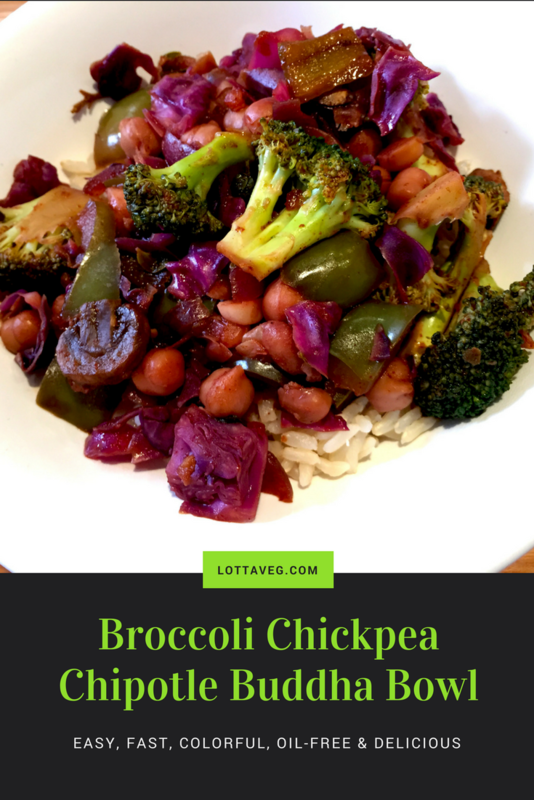 However you decide to prepare this Broccoli Chickpea Chipotle Buddha Bowl recipe, I’m sure you’ll enjoy the variety of tastes, textures and colors. Let us know how it turned out in the comments below! This Cauliflower Chickpea Buddha Bowl recipe was inspired by a trip to a plant-based restaurant in Cuenca, Ecuador. It’s one of our favorite restaurants in Cuenca and they have several Buddha Bowls on their menu. The co-owner and chef, Paul, backpacked throughout South America and ended up in Montevideo, Uruguay where he got a job as a chef in a plant-based restaurant. He returned to Cuenca with one of his co-workers and they opened their own plant-based restaurant called Café Libre. It’s what I would call gourmet vegan food (except for a couple of items that contain eggs). Not only is the food delicious, it’s also presented in a way that is sure to draw your phone from your pocket so you can take a picture and share it with your friends on Facebook. It’s that good! This Cauliflower Chickpea Buddha Bowl recipe is my own creation, made with some of my favorite ingredients and spices. Amelia usually makes our new recipes, but she put me in charge of the Buddha bowls since I love them so much. We had some cauliflower that needed to be used so that’s where I started. Paul has a chickpea Buddha Bowl on the Café Libre menu and we had a can of chickpeas (garbanzo beans) in the cupboard so that was ingredient number two. We always have onions, garlic and chili peppers on hand so those were natural choices. I also like to add mushrooms for their chewy texture. Baby bellas are our favorite type and we usually have some of those in the fridge. Swiss chard is a very nutritious dark leafy green, and recipes like this are a good way to add dark leafy greens to your diet. Kale, spinach or a combination would also be great. You could also skip the swiss chard and pair this with a dark leafy green Hearty Side Salad or a low calorie Spinach Salad. Most of the time, we sauté with vegetable broth to reduce the calories (1 tablespoon has 120 calories) and also because oil isn’t a whole food. There is also a lot of evidence that oil may be as bad for our health as any other fatty food. Dr. Michael Greger thinks of “oil as the table sugar of the fat kingdom” and Mic the Vegan calls it the Vegan Killer. From a calorie perspective alone, we think it’s worth avoiding oil if possible. And there’s absolutely no need to sauté with oil when steam frying with vegetable broth (or vegetable bouillon or water or wine) works just as well. The remaining ingredients give the mixture its flavor and a lot of extra nutritional benefits. Lime is loaded with vitamin C and antioxidants. Apple cider vinegar has been shown to help with weight loss, turmeric has been shown to fight cancer and spices in general are loaded with antioxidants that have been shown to fight aging and all sorts of cancers. I like a little sweetness to go with my spicy so I added some agave. Normally I would use maple syrup, but we didn’t have any (sniff sniff). You can skip this to reduce the calories and the liquid sugar. You can also skip the salt if that’s a concern (especially if you have high blood pressure or kidney disease), but it helps bring out the other flavors. This is a great one-pot lunch recipe that you can make ahead of time and eat it cold or heat it up the next day. I made this a two serving recipe, but if you serve it over 3/4 cup of brown rice, you can get 4 servings out of it. This Cauliflower Chickpea Buddha Bowl recipe is a nutrition powerhouse that’s loaded with healthy sources of protein, carbs and fat. It’ll keep you satisfied and powered until dinner. Enjoy! 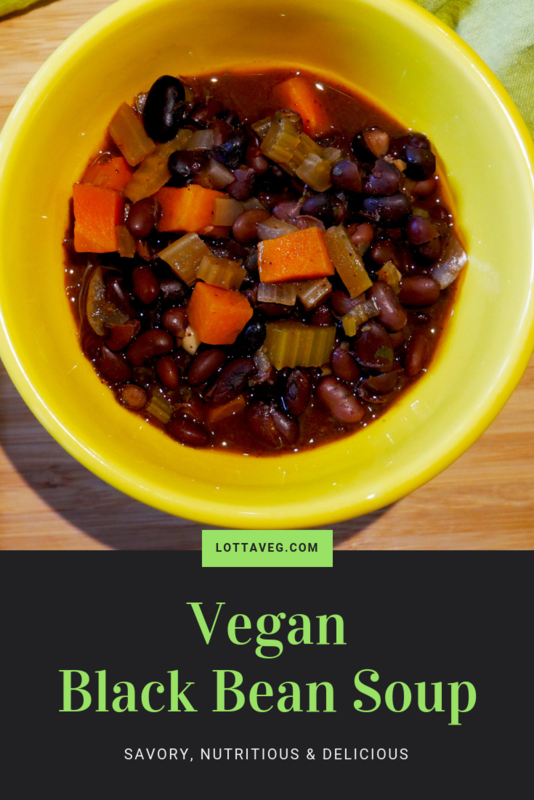 This Vegan Black Bean Soup recipe is like a party in your mouth! It’s loaded with savory flavors and lots of protein. 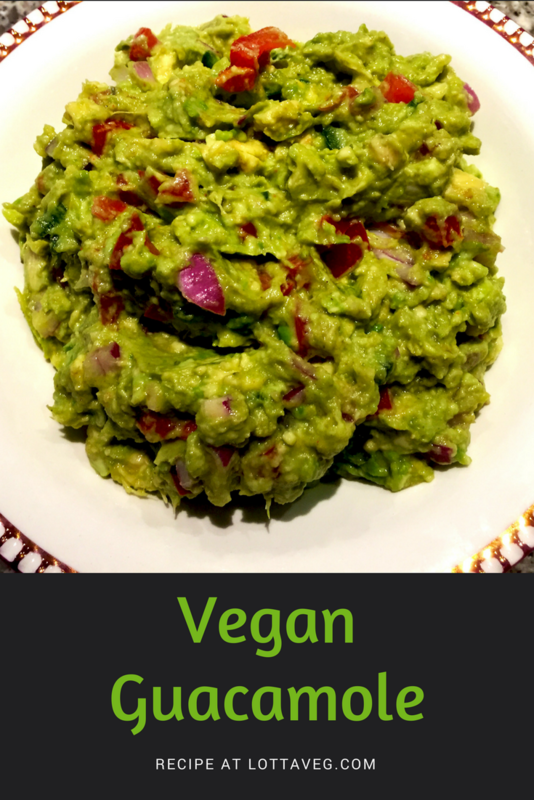 Top it with a little diced avocado for some extra deliciousness and you’ve got one delicious bowl of soup! Beans are a great source of protein, calcium and fiber. That’s why they’re such an important part of a plant-based diet. It can take your body a few weeks (or months) to adjust to the flatulence caused by beans in some people, but the short-term discomfort is well-worth the long-term health benefits. Before we transitioned to a whole-food plant-based (WFPB) diet, I never ate beans because of the horrible stomach and intestinal discomfort. Within a few months of switching our diet, I slowly started adding beans into the mix. Now we eat them every day and only occasionally do they cause gas. I’ve found that red beans still seem to be the worst offenders, while black beans, chickpeas and lentils are now fine. This Vegan Black Bean Soup pairs well with a salad or cornbread.